In this strategy game, you play with decks of illustrated cards instead of a board. These collectable cards represent magical spells and fantastic creatures. 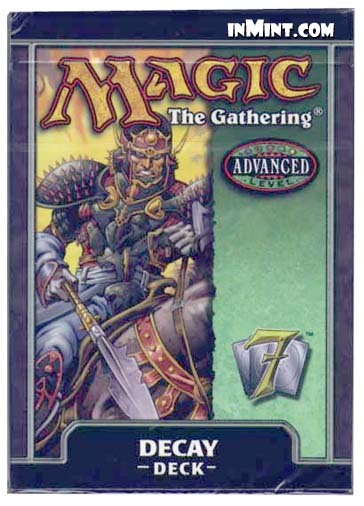 New players should begin with a Magic: The Gathering starter-level game. Live dangerously with "Decay," a deck that features the best qualities of black: death and disease. Hand destruction, creature destruction, and deadly spells make this one nasty deck. A ready-to-play 40-card deck and a customized strategy insert. Rulebook not included.